It has already made itself at home on the top shelf in my kitchen! I will share the rest of my treasures later this week - including my son's newest toy: vintage fisher price from Gramma and Grampa. p.s. that envelope is the metropass...that's its spot. Don't forget to enter the giveaway for a vintage french bonbon tin (from Paris Flea Market)! I love your Pyrex collection! So fun and cheerful! Great addition to your collection! That store I featured a few weeks ago: The Singing Lady, has a lot of Pyrex! I don't know much about the stuff, but apparently it's very popular! My mom has that exact same set of green Pyrex with the white flowers. She got them for her wedding in 1975, and they are still in mint condition! Love your collection and the new addition is great!! This is what I need...thrifted pyrex. I laugh at what they charge for new pyrex...it never crossed my mind to check out the thrift store...Will hit it tomorrow...thanks clever girl. Thx! 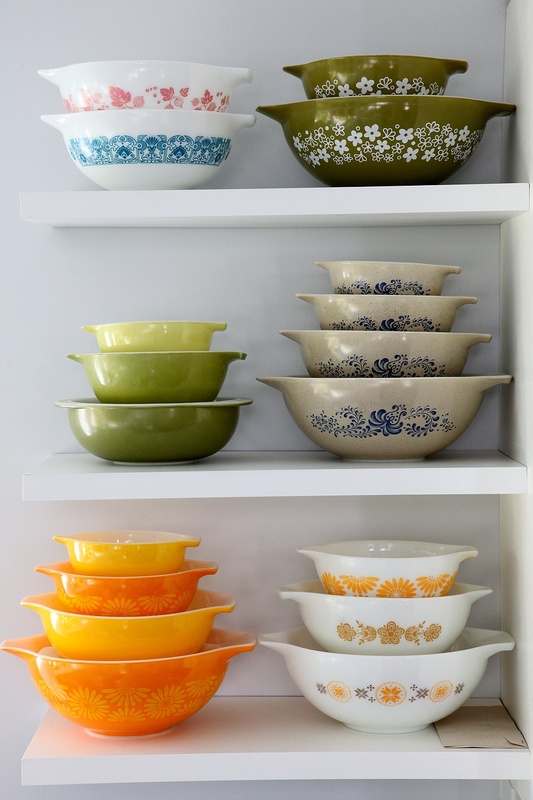 Pyrex makes me happy! 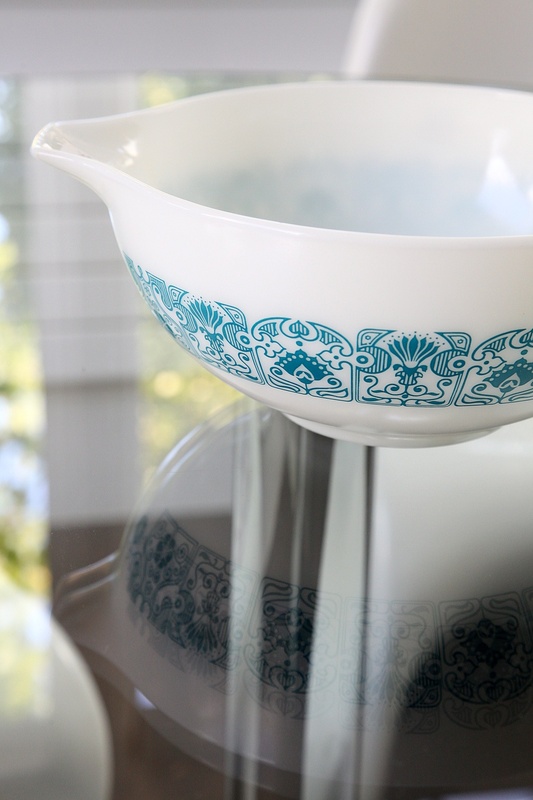 I checked out the store's prices from their website...they are pretty standard vintage pyrex prices...but when you can practically STEAL THEM from the thrift store ($4.25 is a deal! ), its hard to pay more! Make sure she never puts them in the dishwasher!!!! The dishwasher eats away at the pattern! so many vintage bowls at the thrifts!! I have a cupboard full in addition to these ones....happy hunting! I just found your blog and love the way you display your bowls. What do you put in the bowls to build height to show off the smaller bowls inside? I put small bowls to separate all the bowls that you see. Scuffed up pyrex bowls work the best. I have also stuffed a juice box in there as a spacer, in a pinch!